I am in receipt of the first two issues of the University Concourse and find the publication to be interesting, informative and diverse. Ms. DeLine’s observations on the “Preach Out” in Issue 1 are refreshing and indicative of progress in the important area of ecumenism. From Mr. Fischer’s piece on the music issue, which consumed entirely too much time and energy in the 80’s at FUS, I gather that this matter has unfortunately survived well into the 90’s. Of particular interest were the article and editorial concerning the need for a core curriculum. While not present for the debate between issues, I can imagine the potential extremes on the issue: from those who are comfortable with the curriculum as it stands to those concerned that there is too much of a “trade school” mentality. 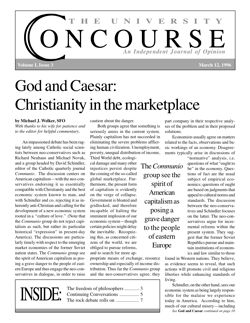 It appears from the content of both issues with regard to this particular discussion that the Concourse has lived up to its name and mission. The Editor’s commentary in Issue 2 is commendably balanced and both the thesis and the conclusion are on point. Ms. Bratten’s article on the absence of fine arts and appreciation for the same serves (perhaps deliberately) to strengthen the position that change is needed. My own experience as an accounting major with a significant additional concentration in history (resulting from interest sparked by taking humanities core courses) was in keeping with Dr. Convery’s response in Issue 2 that students are free to “pursue areas of interest outside their major concentrations” by taking elective courses. Outside the classroom, however, myexperience was similar both to the Editor’s (pre- and, to a lesser extent, post-graduation) and Ms. Bratten’s. Clearly, some evolution of the core is advisable, but this issue needs to be approached with: 1) sensitivity to the strengths and flexibility of the current curriculum and the very positive learning experience already available, 2) a realistic understanding of the requirements of various licensing authorities for minimum in “major credits” in certain fields and, 3) a sense of balance on the other end of the “swinging pendulum” once changes are ultimately made. You are to be commended for the concept—and congratulated for the success—of the Concourse. I look forward to future issues. Chris Wright served as President of FUSA (then the Student Government Association) during his senior year at FUS. Hecurrently lives on Long Island, where he is a Certified Public Accountant, serving a fourth term on the New York Democratic State Committee.